After almost 15 years in the beauty industry, I've got to really know my skin and what works for me. To be honest, its been a huge amount of trial and error, simply because, as a beauty editor you just get sent so much stuff and, you're supposed to try it all. Everything. More often than not, I'd get sent maybe five to ten skincare products a day so really, this was just impossible and I'd kind of got the whole thing down to a fine art - I'd only really try the brands I knew well, the formulas I know suited my combination skin and the textures I loved. After all, there's only so much fiddling about with your skin can take before it has a mini meltdown and spots/dry patches/irritation ensues. However, there's one product I've been desperate to trial for ages. I mean really trial, not just take it home, leave it by the bathroom sink and slap it on when I remember. And it's the battery operated cleansing brush. Yes, yes, I know I'm a bit late to the party but I so love my muslin cloths and lately, when I've been time pressed, my fingers have been pretty good too (a few minutes of face massage teamed with your cleanser works wonders). Also, the brush that rakes in all of those awards (deservedly) costs in excess of £100. Really? Okay I get that price per usage it works out great but I knew that if I wasn't working on a magazine and getting one to try for free, I would probably never spend that much. 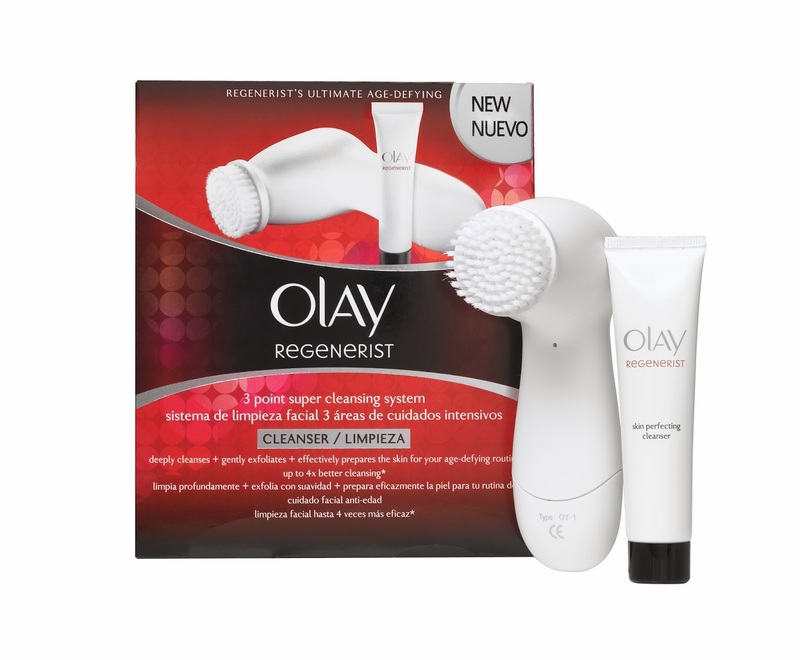 So I give you Olay Regenerist 3 Point Super Cleansing System, £26.99 (boots.com). I have been using this every evening for the last three weeks or so and I can wholeheartedly say that it's brilliant. Why? 1. It cleanses your skin four times better than using your cleanser alone would. 2. It feels great. As the little brush whirls around on your skin it really does feel like it's getting right in there, delving into and ditching any specks of dirt that have tucked themselves into every pore. 3. It's SO easy. Being a new-ish mum this is essential. Massage a bit of your cleanser onto your skin, press a button, move it about for 60 seconds and you're done. 4. You can even do it in the shower. 5. It makes your skin look better. Sweeping away all that gunk means your skin is better prepped to get all that good stuff you're paying for in your moisturiser. 6. It's £26.99! Hope you are well and motherhood is good. I love your blog and read today's post and 'am late to join the face brush party' too. I was going to splash out on the £100 one- but now I have read this you may well of convinced me not too! Thanks and I really hope it works on my 'mama-to-tired-scrub' skin!